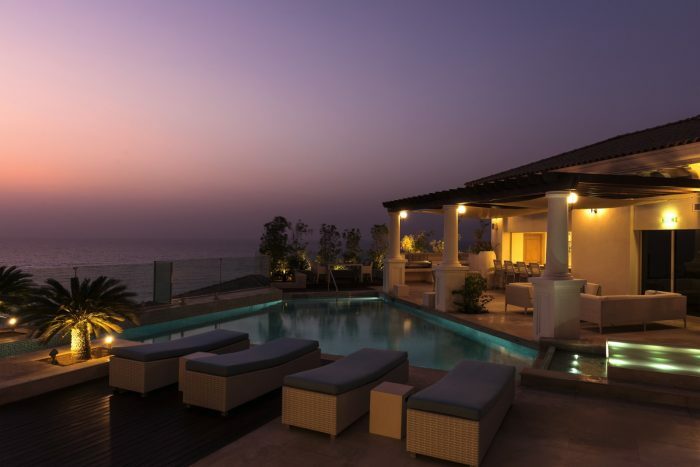 St Regis, Sadiyat Island is located on a pristine beachfront with endless views of the ocean. As you enter the foyer, the beauty of St Regis is magnified by the untold glass fronts showcasing views of blue skies and ocean. Soon, guests realise they have entered their own wonderland paradise as the sun comes beaming in. With stylish interiors, the elegance of this property is inescapable and each furnishing carefully chosen to add grace to the property. Every sprawling guestroom is designed to be grand in style and provide contented comfort; with views from the private balcony that are superb. Decked out in natural tones and colours, the pang of colour is each guestroom brings it to life and you are immersed in luxury. Indulge in spa treatments that have been created to revive you from worldly stresses and enjoy walk around the manicured gardens. Choose a well positioned sun lounger and enjoy some light bites as you take a dip in the pool or you wander to the ocean to collect some sea shells. Iridium Spa is a tranquil haven designed to alleviate your every worry. After your Ayurvedic, Thai or Balinese treatments, try the Vichy showers. Each treatment is carefully tailored to meet the needs of any discerning guest. 12 treatment rooms are seductive in style and provide ultimate pampering and for a truly unique experience, indulge in a treatment in the Moroccan, Thai or Contemporary Spa Suites. SANDCASTLE CLUB – for St Regis’s refined younger guests aged between one and 10 years of age, the Sandcastle club has activity filled days to keep them entertained and energised. Five pools are beautifully located across the resort – imagine the ocean breeze afar, the Arabian heat, palm trees and pruned gardens for your lazy day surroundings. St Regis Athletic Club has state of the art equipment in the fully equipped gym. Whether having a private training session or going for a run, the athletic club is a much needed stop for your well being journey. A stay at St Regis, Sadiyat Island for a honeymoon is impeccable from beginning to end. Contemporary, Mediterranean interiors create a palatial feel and the view of the Sea and Golf Course is uninterrupted. A property that floods its foyer with sun light and such tropical views is dazzling. Each guestroom has been designed to focus on the Island’s beauty and give majestic views of the glorious expanse that prevails. Floor to ceiling windows, private terraces and magnificent furnishings are just some of the wonders that guests have to look forward to. Time spent in the guestrooms will be calm, relaxing and intimate. The Iridium Spa is wonderful and after you visit you will leave feeling refreshed and relaxed. Indulging in an exquisite restaurant with an excellent calibre of menu or at the Spa, pool or on the beach, you and your loved one will embrace each moment at this beautiful property. Dining at St Regis makes every meal a lasting memory. 55&5th, The Grill – named after the address of the Original St Regis, this New York style deli and grill serves dishes that are yummy in taste. Olea – All day Mediterannean dining options that can be enjoyed al fresco or indoors. Turquioz – located on the beach fresh seafood with the ocean afar. The Drawing Room – St Regis Tea ritual is a wonderful treat, serving signature beverages and light bites. Sucre – Handmade pastries and bespoke cakes that will leave you begging for more.